While Apple added dedicated Notes and Reminders web apps to iCloud.com last month, the web-based implementation of Reminders left out at least one important feature: shared reminders. OS X Mountain Lion users have been able to share reminders via the native Reminders app as of OS X 10.8.2, but Windows users and others needing to access iCloud via the service's website have been unable to set up new shared reminders. The feature is also missing from the Reminders app in iOS 6. 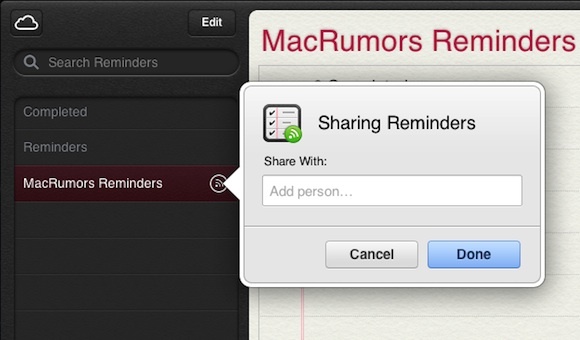 Within the past several days, Apple has apparently rolled out shared reminders for the Reminders web app on iCloud.com, bringing the functionality closer to par with the native Mac app. There appears to be no word yet on whether the functionality will be making its way into the iOS 6 Reminders app, but it does appear that Apple is heeding at least some calls for making the feature available across platforms. What? Apple actually updated a feature without waiting a full year for iOS 7 to make this a "new feature"? Say it ain't so! Only problem is Reminders are not possible to get Push notifications are they? To test, make a reminder on your iPad. Now set the reminder to go off in 5-10 minutes with an alarm. It will only go off on the original device the reminder was made on. That is unless you open the Reminders app on the iPhone and let in sync up(Fetch). I've always thought this was a flaw from it being perfect. Anyone else notice this? Must be some problem with your setup because it works for me. Reminders are pushed between iOS devices and my Mac as well. In fact, after creating the Reminder on my iPad with your test instructions, I never even woke my iPhone from sleep and it still alerted me. Plus my Mac popped up the alert in Notification Center. So not only do you not have to open your Reminders app, you don't even have to wake your iPhone. Really love iCloud ever since Apple nailed down the integration with the release of iOS6 and Mountain Lion. Yeah, the whole Reminders implementation, at least for iOS, is pretty half-baked. I could write an essay about the many ways in which it could be improved...except that I'm too busy not writing essays about stock iOS apps (but trust me, I use this app daily, have six shared lists, and often find myself cursing at it because of its many shortcomings). I don't recall that you could ever change permissions on reminder lists to share them with others in iOS. It was always on icloud.com. It would certainly be nice if you could manage them in iOS. I'm happy to see they finally put it back in icloud.com - I'm a little concerned that it ever went away. You're correct, sharing was never available via the iOS app (looks like the article was updated), which is kinda pathetic, in my opinion, seeing as there are "share" buttons throughout iOS for just about everything else. Maybe that's a way to prevent abuse of the feature? Imagine a spammer adding your email address to a reminder list that tells you of "deals" that no one cares about, etc? That wouldn't be possible as shared Reminders lists are similar to Calendar invites wherein the recipient has to "accept" or "subscribe" to the list before it shows up on their device. When will they bring threaded email display, like the OS X Mail.app and iOS 6 Mail.app? Gmail.com has had it since 2004 or something; it's not impossible. Nice to see this return. This is one area where I wish Apple was more transparent. I have been so put off by iCloud, that it would be nice to know what features are going to be added. iCloud still has a long way to go in my opinion. I still miss .Mac. And for the love of God, please ditch that obnoxious "Noteworthy" font. None of us are fooled into thinking we wrote the text in by hand. Its almost as bad as Comic Sans! If anyone at Apple reads these forums, please get rid of the really crappy skin on the iCloud version of notes. Still don't know how to get notes to work without signing up for a new account. Right. Because there's no way to do that. Why wouldn't you sign up for an account and just be done with it? Shared reminders has been great for keeping a shopping list between my roommate and I.